I collect old-school VHS videos. Mainly UK VHS, but sometimes UK Betamax too. And mainly tapes released in the first half of the 1980s. Ex-rental stuff from dingy old video shops which reeked of cigarette smoke. Obscure genre nonsense: mostly horror, sci fi, fantasy, action, with lurid cover art. 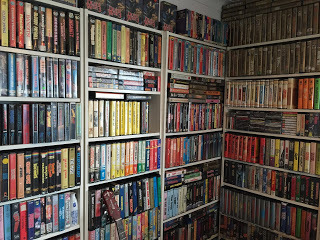 So if you've just had an attic clearout, or your dear old grandad used to run a video shop and now simply doesn't know what to do with his old stock, get in touch! One title I'm particularly looking for, is one specific release of Flesh Eaters which was distributed by the Birmingham-based Knockout label. One day, I shall lay my gnarly claws upon it, oh yes and no mistake. If you can help, drop me a line.